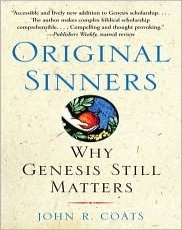 Thoughts on Genesis as Literature? The stories and characters of Genesis have already shaped you more than you realize. They are embedded in the foundation of our culture. They are part of us all and belong to us all, the religious and nonreligious alike. In this vivid, original interpretation of Genesis, former Episcopal priest John R. Coats takes readers on a journey through the ancient text, inviting them to see its characters in a new light, not as religious icons, but as people whose day-to-day concerns, triumphs, and failures are like our own. In Coats's telling, the relationships of Cain and Abel, Jacob and Esau, Rachel and Leah, and Joseph and his brothers take on stunning contemporary relevance as these characters find themselves confronted with extraordinary situations and circumstances that they'd neither asked for nor had anything to say about. Using stories from his life as well as the lives of people he's known, Coats creates a rubric you can use to examine your own life and to discover aspects of yourself in the characters whose lives unfold in these primordial stories. How has Eve's story shaped yours? Is your life reflected in Jacob's evolution to wisdom? In Joseph's youthful arrogance? Coats explores the strengths and weaknesses of the men and women in Genesis, pulling back the wrappings that have hidden their humanity to reveal the vibrant drama of these foundational narratives. "Different clothing, yes, and language, and customs, yet at the human level," he writes, "they were just as greedy and generous as we are, as gullible and crafty, as moronic and brilliant, as cowardly and brave. They are us, their stories, our stories, mirrors in which to see our best and worst selves."